Not long ago I wrote: “When I think of summer I think of rum drinks. And when I think of rum drinks one of the first cocktails that comes to mind is a classic: Mount Gay Tonic.” Well, an equally classic summer rum drink that comes to mind is the Dark ‘n Stormy. 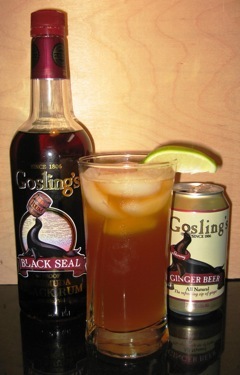 While no doubt made with a number of dark rums, there is no debate over the fact that the traditional Dark ‘n Stormy version uses Goslings Black Seal Rum. In fact, as the New York Times reported, Goslings trademarked the drink so only those made with Goslings can legally be called Dark ‘n Stormy. The other key ingredient of the drink is ginger beer. (Anyone who tells you this is the same as ginger ale is woefully misguided.) The strong ginger taste of the ginger beer melds with the dark rum to create a fantastically flavorful concoction with a punch that is known as Burmuda’s national drink. For the recipe, one part Goslings, two parts ginger beer works perfectly. Simply serve over ice in a highball glass and garnish with a wedge of lime. For the truly adventurous, you can swap regular Goslings for the ultra-high proof Goslings 151, something I did a few times during my college days with varying results. When it comes to pairing the Dark ‘n Stormy with a cigar, you’re going to need something with some spice to stand up to the zesty ginger flavors. Three smokes that come to mind are the Arganese CL3, La Gloria Cubana Artesanos de Miami, and my top choice for a pairing, the Gran Habano #5 Corojo. I suspect a fine Cameroon-wrapped cigar like the Fuente Don Carlos No. 2 would also go well. Drink a few Dark ‘n Stormies and you’ll be wondering why you’ve never visited Burmuda. After all, if a Dark ‘n Stormy in one hand and a fine cigar in another isn’t a slice of paradise, what is? This is one of my favorite summer libations. Barritts is truly the only way to go with this; however, I have also found Reed’s Original to be a worthy substitute. The pairing with the Gran Habano #5 Carojo is spot on, very good pairing. It made my weekend. If you ever get some Blenheim’s Ginger Ale (the full strength variety with the pink cap), you will never want a Dark ‘n’ Stormy with anything else. It’s available in central North & South Carolina. Best stuff in the world!